I love spreads, dips, and sauces! No, but I mean, REALLY LOVE. You can pretty much put them with anything and the deliciousness never seizes. Here in Florence, Italy I have come to understand that spreads, dips, and sauces are a staple anywhere you go and with whatever you choose to eat. In the Tuscan part of Italy the bread is not salted, so it is expected to add a little bit more flavor with cheese, olive oil and vinegar, jam, or pesto. And, let me tell you, there is A LOT of pesto. All of it is yummy and really easy to make. So when you need a quick and easy snack on the go, it’s super convenient to just grab a slice of Tuscan bread and dip/spread pesto all over it! 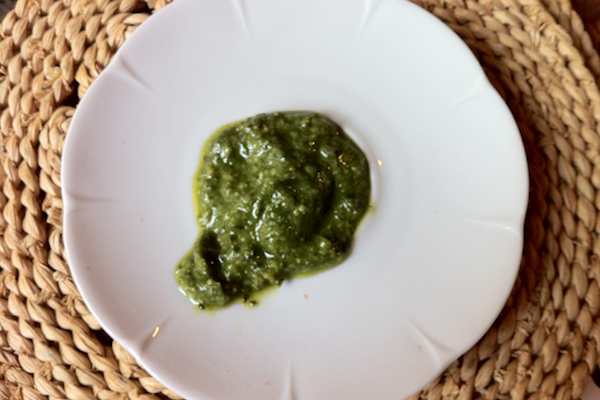 But the best part is, pesto is a fantastic way to bring the Italian Tuscan countryside to the States! Here’s how. Note: You can add the pesto to pasta or just spread it on bread or crackers. If you decide to make pesto pasta, remember to retain some of the water that you cooked the pasta in to keep the pesto less dry and “slimier” (in a good way). You can be really awesome and combine all the ingredients except the olive oil with a mortar and pestle or you can combine by chopping. The fineness of your pesto is up to you. You can chop it very fine (or put it through a food processor, NOT a blender) or roughly, and you will get a different texture. Figure out which you prefer and chop according to your taste. Put the freshly chopped ingredients in a small bowl and cover with the oil straight away. Drizzling the oil over the ingredients right away will stop the basil from going oxidizing and turning black. You can store your pesto in the fridge and eat it as a spread/dip or you can mix it into your pasta dish once the pasta is cooked in salted boiling water. Categories: Campus Cooking, Featured, How To, and Recipes. I'm Cooking For...: Dates, Dinner Party, Easy Dinner, and Myself. Type of Food: Finger Food & Dips and Vegetarian. I Don't Eat: Any Animal Products, Carbs, Dairy, Gluten, and Meat. Definitely going to try this, I need an alternate option the tomato-based sauces. Can’t wait! !